What’s different about the Financial Integrity Program? Many books and "step programs" on managing your money are available today. What most of these books have in common is that they assume your financial life functions separately from the rest of your life. 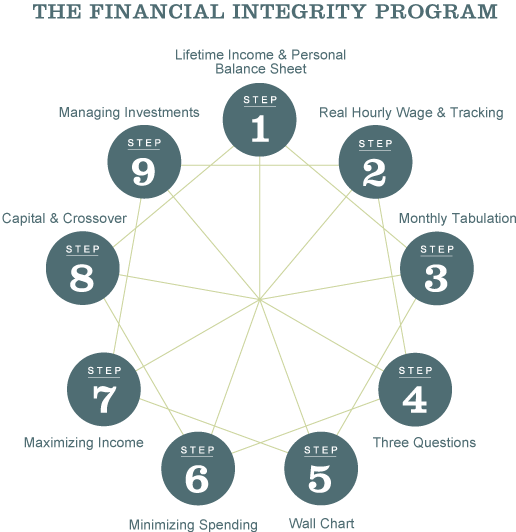 The Financial Integrity Program is different. It is a 'whole systems' approach to your life. And it will take you back to basics -- the basics of making your spending (and hopefully your saving and investing) of money into a clear mirror of your life values and purpose. The purpose of the Financial Integrity Program is not to sell you anything -- a product, a guru, a lifestyle. You don't need any of those to achieve your goals. But you don’t need to go it alone, either. By using this proven, comprehensive program of nine steps based on classic financial principles, you can get where you want to go faster than making them up yourself. And it’s all free. Are you comfortable with the amount of money you have? Is it enough? Are you spending as much time with family and friends as you would like? Do you come home from your job feeling fulfilled? If you were laid off from your job, would you see it as a tragedy or an opportunity? Do you have enough savings to support you through six months of normal living expenses? If you were to die in the next few years, would you be comfortable with your legacy or contribution to your family, your community, the world? Are all the aspects of your life – your job, your possessions, your relationships, your values – integrated? If you answered, 'no' to even one of these questions, read on. How healthy is your relationship with money? So many people find money – the lack of it, the worry about it, the time spent making it, or the guilt associated with having it – to be an obstacle to happiness. Money often becomes the cause (or excuse) for people not living their dreams or exploring what their life could really mean. This program is about helping you eliminate those obstacles and use money as a tool to get on with the life you want to live. It will coach you in how to act with intelligence, integrity and independence in relation to money and the economic pressures we all face. Having "financial integrity" means understanding the true impact of your economic interactions, and having that impact reflect your true intentions. The purpose of engaging in the exercises and practices outlined in the FI Program is merely -- and profoundly -- for you to transform your relationship with money. That relationship encompasses more than just your earning, spending, debts and savings; it also includes the time these functions take in your life. A healthy, integrated relationship with money is innately tied to the sense of satisfaction and fulfillment that you can get from your engagement with your family, your community and the planet. Read how others have adopted the program, read a brief description of the steps, or download the Financial Integrity Program Guide.